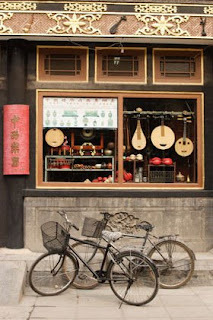 The architecture and atmosphere of Liulichang Street is a taste of Old Beijing. Buildings with classic sloping tiled rooftops line what is for the most part a long pedestrian lane, save a few bicycles and stray cars. Centuries ago the area was a cultural center popular with scholars, artists and poets and its literary past remains today housing some of Beijing’s finest book stores. Liulichang gets its name (which means glazed tile factory) from kilns that once stood there producing ceramics used to build the Imperial Palace. Liulichang is well known for its antiques and calligraphy shops as well. 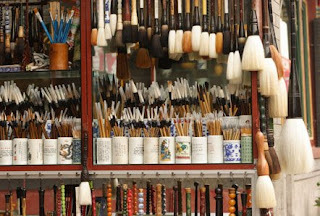 But there is plenty else to buy for all budgets including a wide range of handicrafts and curios that make great souvenirs or gifts. There are also some quality teashops. The western end of the street features outdoor vendors selling Cultural Revolution kitsch, Buddha statues, inexpensive ceramics and assorted bric-a-brac. Bargaining hard is customary. Vendors expect it and prices tend to start higher here, as the market is popular with tourists. To get there take the metro to Hepingmen Station. If you take a cab ask the receptionist of your hotel to write the name in Chinese so that you can hand it to the driver. Most hotels have business cards written in Chinese and English and are happy to write your destination in Chinese on the back. oh yes, please, I will have all of those brushes...They are *so* Wearstler! Every time I look at that photograph I regret not bring some back. There are so many differnt views of this place. These images are very clean and interesting then there are other images I have seen that envoke a whole different feeling. It's a great place to walk around and photograph.